A recent release from Consumer Reports puts Samsung’s recent releases at the top spot when it comes to cell phones – calling up comparisons once again of the Galaxy S9 vs iPhone X. While the Consumer Reports ranking isn’t necessarily a reflection of each device’s value, it does drive home the fact that the Galaxy S9 vs iPhone X race to the top is closer than we expected. While many were disappointed in the lack of features that the Galaxy S9 brought to the table, the phone managed to snag the top spot – although just by a slim margin. When comparing the Galaxy S9 vs iPhone X, it’s important to keep in mind that only a few points separate these top phones. While the iPhone X actually came in 8th on the list of top smartphones, the top 20 ranked devices were only separated by six points – an incredibly close race that is a testament to the quality of the best flagships on the market. Samsung made a grand showing on the Consumer Reports list, with the Galaxy S9 and S9 Plus taking the top spot and the Samsung Galaxy 8 just below it. In third and fourth come the Galaxy S8 Active and Galaxy S8 Plus, making one wonder if Samsung’s devices are actually, truly, that much better than the competition. According to the rankings, the top of the list is dominated by Samsung, although it was close —just six points separate the top 20 ranked devices, Consumer Reports said. A tight ranking means that the difference when comparing the Galaxy S9 vs iPhone X is negligible, but is the Galaxy S9 truly better just like the Consumer Reports release suggests? The answer may not be that simple. Multiple outlets from around the web have suggested that Consumer Reports is notoriously biased against Apple – consistently ranking their products lower than the majority of reviews and customer feedback would suggest. It’s important, then, that you take this report with a grain of salt – just as you would any review. 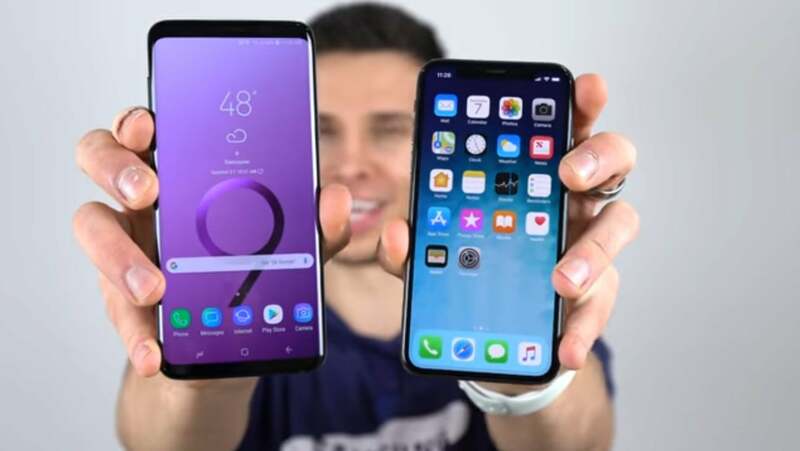 While Consumer Reports is certainly a legitimate organization with value to their opinions, even the best outlet may struggle with bias – making this Galaxy S9 vs iPhone X battle that much more challenging. One interesting fact to point out is that, prior to the Galaxy S9 release, the iPhone X took the top spot for camera quality – beating out other Galaxy devices to reign supreme when it came to picture quality. The fact that the S9 came in first is surprising, especially considering the lukewarm reviews and lower battery life than the previous model and a camera system that isn’t as much of an improvement over the S8 as the Korean tech giant would like to suggest. Consumer Reports did provide their reasoning for ranking the Galaxy S9 vs iPhone X in Samsung’s favor. The S9 performed better in drop tests, making it through 100 drops with “just minor scratches.” The S9 Plus was actually more fragile, breaking on the second series of 50 drops. Also praised with the superior speakers, the retention of the headphone jack, and security features. The company did acknowledge the poor battery life and over-sharpening of photos, but the phone still managed to snag the top spot. The fact that the decision came down to features like a headphone jack, screen hardiness, and security features really makes the Galaxy S9 vs iPhone X comparison a close race. The head of Consumer Reports’ smartphone testing, Richard Fisco, said that “It really comes down to personal preference when you’re talking about high-end phones these days.” And we find that this is more true than ever before. Whether you side with the Galaxy S9 or the iPhone X, you’ll enjoy a phone of comparable quality that represents some of the best technology on the market. While many were wondering whether the Galaxy S9 would demolish the success of the iPhone X, the fact remains that the sales were rather lackluster – potentially due to a lack of new features. Apple has proven that innovation drives sales with the incredible demand for the iPhone X and the new FaceID features – a brand new way of unlocking your phone using facial recognition that adapts to changes in appearance. Long story short, if you’re looking for flashy new technology with a novel design and enjoy the notch rather than finding it a detractor, the iPhone X may be your best bet. Otherwise, the Galaxy S9 provides a solid quality phone that makes comparing the Galaxy S9 vs iPhone X a decision with no clear answer. Factors like aesthetic preference and preference for specific operating system may drive the decision-making process with these phones remaining neck-and-neck.